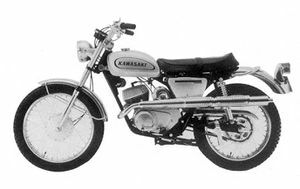 The Kawasaki Bushwhacker F3 was produced by Kawasaki from 1968 through 1970 as a dual-purpose motorcycle. The Bushwhacker had a new tubular-type chassis replacing the older pressed steel frames of the Kawasaki F1 and Kawasaki F2 models produced in the early to mid 1960s. Its 175cc engine was also updated from the earlier F series design, now producing 20 hp @ 7,300 rpm and featuring rotary valve induction which greatly increased performance. The off-road image of the Bushwhacker was also enhanced by the inclusion of a stylish upswept exhaust. Remarks: Has electric starter, dual sprockets,and De Carbon rear suspension. This page was last edited on 27 November 2010, at 17:00.